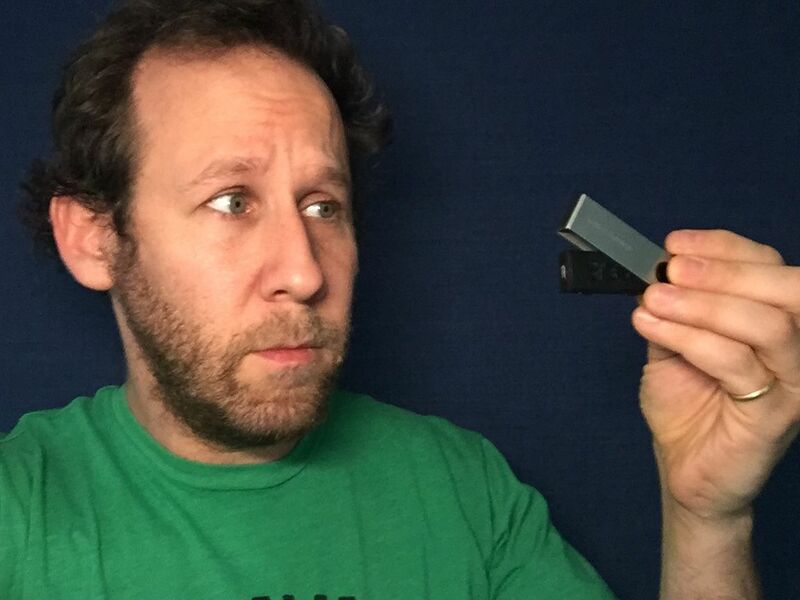 Live-Blogging my "Ledger Nano S" Panic Attack!!! For months, people have been warning me about crypto security and telling me I have to start using cold storage for my cryptos and getting them off the various exchanges I have been leaving them on. I ordered a Ledger Nano S and it arrived last week - and has sat staring at me from my desk since then. I tend to experience some beginner's anxiety with each new technology I incorporate into my life. The learning curve is always steep and often requires learning a new language I never had any interest in. Then yesterday, after the Binance hack, I boldly proclaimed “Tomorrow! I will set up my Ledger tomorrow!”. Back from dropping my daughter at school. Im going to start now. Checking my email. An alert from iTunes saying there is a new episode of “The Assassination of Giannni Versace” ready for me to download. Im gonna watch that first. This show is so disturbing. I started watching it because a friend has a bit part. I feel shaken up after every episode. Taking a break while my wife takes a phone call. Decided to use this opportunity to pull the shink rap off the Ledger Nano S. Whew. Step one is done! Wife is off the phone. Putting the show back on. She got another call. Pausing the show. All done. Sitting down at my computer. Taking the Ledger out of the box. Looks like a heavy duty USB stick. Not much info inside. A card tells me to “Get Started at start.ledgerwallet.com" - so Ill do that. My Ledger Nano S is now connected to my computer and I have created an 8 number passcode. I am now writing down a 24 word recovery phrase. My heart is beating. Total anxiety. My wife wants to chat about the short film she is making - https://ioneskye.squarespace.com - I happily accept the distraction. Except I am simultaneously irritated at having to stop this Ledger process now that Im finally in it. We discuss her financing prospects. Back to my computer. “My device is now ready” the Ledger proudly displays. For what? What do I do now? On the Ledger site it tells me to download the free the Ledger Wallet Bitcoin Chrome app or the Ledger Wallet Ethereum Chrome app from the app store. Ok it is installed. I am now sending my Bitcoin (my largest position) from Binance to my Ledger Wallet. I am challenging David Blaine’s breath holding championship title. Still waiting for my BTC to show up on my ledger. This is taking a while. Did I manifest this through my anxiety? Is it possible to make things worse by fearing them? I suddenly remember the advice to always transfer a tiny bit of crypto first to test whether the transaction works. Needless to say, I didn't do this. I just jumped in and tried to transfer my largest holding right away. I want to call my mum. Have I lost my BTC? I start googling “BTC recovery services” - inspiring to find there are a few options! I can’t believe this is what my day has come to…. Depressed. Just took a bath. Listened to David Oyelowo on Marc Maron’s WTF Podcast. Still no sign of my BTC. Gonna go out and get some lunch. Oy vey. Went to Veggie Grill and ate a Vegan Buffalo Bomber Burger with Sweet Potato Fries. Stopped for a Cappuccino with an extra shot at Blackwood. Came home. Resigned to having lost my BTC, this will be a learning experience, and one that I will be grateful for one day. It arrived! There it is in my Ledger Bitcoin Wallet. So there you go. The Ledger Nano S. Super easy and stress free. Couldn't recommend this experience more highly to anyone looking for an emotional rollercoaster rider or simply trying to shave some years off their life. Most of my Bitcoin is on paper wallets. I really need to get a Nano or a Ledger. And figure out how to access the BCH and BTG. It’s easy to hodl if you’re a procrastinator. Just to make life more interesting for you. You should be using the 24 seed words plus the secret. Partly for plausible deniability of you are forced to unlock the ledger. But more importantly, you need to store the 24 seeds somewhere securely. But if anyone gets hold of them, then they own your crypto. With the 24 plus one, you don't store the two parts together. So, ledger have added another layer of security with the extra seed that is secret. It will generate a new set of addresses and wallets, this you have two sets. One for the 24 seeds that can work as a short term place to keep stuff. And the 24 plus secret that can act as a storage for larger amounts. EDIT: I see from the comments that there are a lot of new people to the crypto ecosystem. Please, don't buy hardware wallets from anyone other than the manufacturer. The hardware wallet will generate the seed words when you set it up, it will never never never be pre set up, it will never have the words on a piece of scratch here paper. Please be safe, ask people that know what is going on to help you. Great advice! Yes I had heard about people getting tampered wallets from Amazon. Got mine straight from Ledger. And thanks for the tip about the extra seed! Don't worry about it unless you are acquiring other cryptos. Steem Power is safe on the wallet here as long as you keep your password protected. The cold storage is for Bitcoin, Ethereum etc. love learning from you, and laughing along with you at the absurdity of all this. whatever happened to trading baseball cards?! you are a crypto-sherpa to more than you know, including me! thanks ben! I don't have huge positions as far a investment goes but it seems so complex to store them. I am hoping one day this will all be made so much easier... until then I have everything crossed and I am keeping touch with the investment angels!! The Active key 'is used to make transfers and place orders in the internal market', I actually meant the owner key, which is the master key for your Steemit account. Oh okay, and you change it to a password of your own choosing rather than the encrypted one you are given? Cold storage is definetely needed, many years ago I purchased 15 bitcoin when they were $4. 10 of which I kept in the online wallete 5 on a printed wallet. USB cold storage is the best. Hahah!! Totally. Have any thoughts on trezor aswell? The emotional roller coaster you describe is a big part of crypto not being more accepted by the general public. Every single time i transfer btc or any “slow coin” i go through the same anxiety lol. Lol! This was really funny. That vegan burger sounds amazing. Did you take a photo? Nicely done @benleemusic. Very entertaining read too. Glad you eventually got the BTC into your ledger.